Connecting your players on a personal level is key to fostering team spirit. Try these 30 activities to help teammates gain trust on and off the field. Silly Skill Building - For a baseball or softball team, try to hit a few water balloon pitches. For soccer, look up binocular soccer online and try it as a team — very fun! I Have Never - Have everyone raise a hand for each question they can answer as true. Start to call out things related to your sport like "I have never been hit by a pitch” or “I have never played goalie.” Players will get a good laugh the more creative you become. Silent Line-up - Without using words, have team members communicate and line up according to birth month, birth date, how many siblings, the last digit of their phone numbers, etc. Talk about non-verbal communication and teamwork afterward. Brainstorm - As a team, come up with a list "10 Signs You are A Good Team Player" and use these to encourage good sportsmanship throughout the season. Team Show And Tell - Before practice, tell players you will be having an old-fashioned show-and-tell session. Have team members bring a favorite item (can be sports related or not) that will tell teammates more about them. Organize swim team volunteers with an online sign up! SAMPLE. Blindfolded Partner Obstacle Course - Set up a partner obstacle course on your field of choice, but the catch is one partner is blindfolded and the other must guide them through the course. Thumbs Up and Thumbs Down - Have the team go around and share something from their day (or week) that was a thumbs up and something that was a thumbs down. This gives members time to hear about their teammates lives outside of sports. Get to Know You Ball - Take the ball of your sport (or use a beach ball), write numbers randomly on it and throw it around a circle. Whoever catches it looks for a number under one of their fingers that corresponds with a question they get to ask a teammate such as, "What is your favorite movie?" or "What is your favorite sports team?" Team Seek and Find – Give players a list of items to check off so they can get to know teammates better. For example, have them find people with the same number of siblings as them, people who like their favorite candy, people who have the same color of eyes as them, etc. Give them a set amount of time to find people with similarities. An air horn makes this fun! Aces at Races - Assign players a partner and hold some crazy races, such as a wheelbarrow race, three-legged race or back-to-back with a water balloon between them. Change it up and have them carry an object (soccer ball, football, tennis ball, etc. and try the following variations. Field Trip - Visit a fun indoor sports complex together such as a trampoline complex or ice-skating rink. You could also do team building at an outdoor ropes course. Sports Buddy - For a school sport, assign teammates a secret pal and decorate lockers, write encouraging notes or have the coach deliver a treat before a game. Breakfast Retreat - Can't get away for a weekend as a team? How about a Saturday morning retreat including breakfast and some fun get-to-know-you-games. Don't forget to wear your favorite slippers! 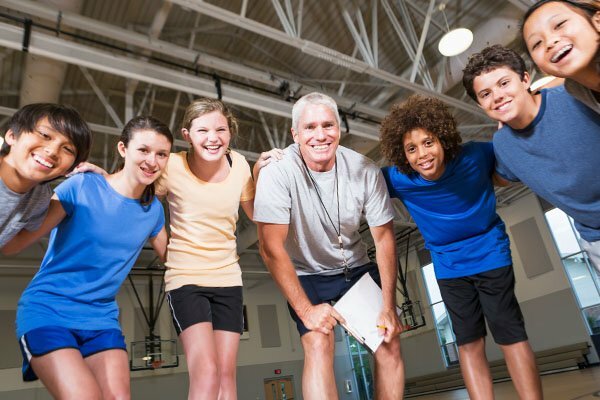 Mentor Together - Have your team organize an after-school sports clinic for a local elementary school or at a community park. Game On - Throw a game night (have several games going at once) and pizza party at a player or coach's house. Have players bring their favorite board game — make sure to include some that are luck vs. skill-based. Scavenger Hunt - Make a list of wacky things or challenges (team members must be in the pictures!) to capture on smart phone camera and meet for an evening of team fun. Pick the location based on the age of your players — a park with parent supervision for younger children or the local mall for a group of teenagers. Fun Run –Choose a 5K run that benefits a cause important to team members or pick an offbeat race like a color run or bubble run to complete as a team. This is also great for pre-season conditioning. Escape Room - Many cities have these types of facilities that encourage your group to work together to solve a mystery or escape a situation. For older kids, this is a great team-building challenge. Team Swag - For the crafty types, get together for an evening of decorating team visors, team T-shirts or using paint pens on flip-flops to encourage team spirit. Next Level - Attend a local college, minor league or semi-pro team game together. Talk about their teamwork over ice cream afterward. 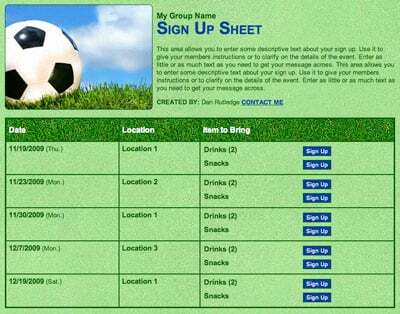 Schedule game day snacks with an online sign up! SAMPLE. Hot Lava - Use a two full-sized bed sheets and divide the team onto two "islands." Pretend there is "hot lava" all around them. The goal is to get their sheet turned over while keeping anyone from stepping (or falling into!) the hot lava around their island. Shake It Competition – Ahead of time, you’ll need to attach an empty tissue box to a belt so that when the belt is closed the box rests on a person’s back. Put three Ping-Pong balls inside the box. Divide into two teams. In this simple relay race, competitors take turns putting the belt on and seeing who can empty the box by shaking their backside. Pretty funny to watch your teammates’ "shake it" techniques! Feet Compete - Two teams compete to pass a large exercise ball around a circle. The trick is that everyone is on their backs and has to pass it with their feet. Stack ‘em High - Build a card towers (or towers) out of red plastic cups in teams to see who can get the highest tower, most unique construction or highest tower the fastest. Clothing Relay Races - Gather two piles of oversize pants, large blazers, a necktie, a dress and some funny accessories and challenge teams to dress or undress relays — or dress the coach challenges. Pass the Hoop - Get two hula hoops, divide the team and have players join hands in a line. Pass the hula hoop from the front to the back of the line without breaking hands. For more challenge, try timed races or make players close their eyes. Gear Recall - Two teams send one person each to view gear on a table for 10 seconds at a time. They leave and stay silent, with their back turned, until everyone has viewed the gear. Then teams are challenged to recall all the gear. Whoever recalls the most is the winner. (Up the challenge: Make a grid on paper and on the table with tape and they have to remember the item AND where it was on the table). Red Cup Relay - Break into two teams, and mark a "fill line" in the same spot on red plastic cups. Fill two cups to the line (one for each team), and give remaining team member an empty cup. Pass the water from the original cup by lifting it up over head and pouring into the cup of the person behind them. The winning team has its final cup filled closest to the beginning fill line. Caterpillar Crawl - Divide into teams and place filled balloons between each team member at chest/back level. The team must caterpillar walk their way down the field, not dropping or popping any of the balloons that are balanced between them. Trust and teamwork are important for any group, but sports adds a layer of competition that can bring out the best (or worst) in teammates. By adding some fun team building activities into your season, your players will grow in their ability to communicate and respect each other on and off the field.